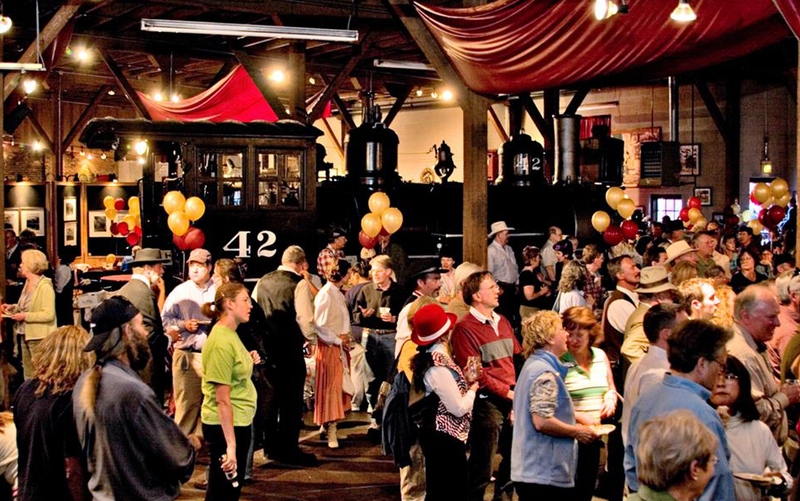 In 2006 the Durango and Silverton Railroad Roundhouse Museum served as the backdrop for Durango’s 125th anniversary celebration Founder’s Gala. Durango (pop. 15,000) is located near Four Corners, a point that connects Colorado, Utah, New Mexico, and Arizona. The region was initially inhabited by the Anasazi (Ancestral Puebloan) Indians until the 1300s. By the 16th century the Ute Indians populated areas close to Durango, and they are still a vital part of the region today. Durango was founded in 1880, and incorporated in 1881, when the Denver & Rio Grande Railroad Company established the town as a hub for its rail system into the mountains. Originally used to transport ore to the smelters in Durango, today the Durango & Silverton Narrow Gauge Railroad transports approximately 200,000 tourists annually to visit the historic towns of both Durango and Silverton, and to enjoy the stunning mountain vistas and the Animas River canyon in between. The community of Durango has evolved from a mining town to a town that thrives as a result of dedication to preserving its history and culture. Particularly in the heyday of Hollywood westerns, Durango also served as a base for many movie productions. Today the historic steam train, the Animas River running through the center of town, three historic districts, and the surrounding mountains and national parks offer a wide range of activities to attract visitors. A successful community project was the preservation of the 1893 Colorado Ute Power Plant, which after a nearly decade-long effort was reborn as the Durango Discovery Museum (now the Powerhouse Science Center). In 2006 the Durango & Silverton Railroad Roundhouse Museum provided the backdrop for Durango’s 125th anniversary celebration Founder’s Gala. It was a fitting location, as the museum and train station anchor Durango’s Main Avenue, which is lined with many of the town’s historic buildings, including numerous restaurants and businesses such as the 1887 Strater Hotel.